American Expedition Vehicles, based out of Missoula, Montana, has been building custom vehicles designed to tackle the rigors of off-roading, overlanding, and general day to day commuting since 1997. AEV originally gained a substantial amount of publicity with their line of stretched Jeeps that dds a pickup-style bed behind the cab area, creating a highly functional and visually appealing work of art. This unique upgrade melded with additional suspension and powertrain upgrades from AEV has created a vehicle that many would argue should have been available from the factory. 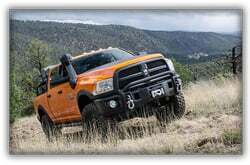 With the Jeep market cornered, American Expedition Vehicles unveiled its lineup for the Ram Heavy Duty market in 2014, dubbing this new application the Prospector. The Prospector has taken the same approach that AEV has always taken, to produce products that serve a functional purpose and design and build these products to a standard that exceed even OEM (Original Equipment Manufacturing) standards. 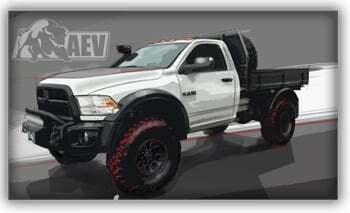 With the original unveiling of the Prospector at the SEMA Show in 2014, AEV has gained and continued to build on the notoriety they have had for years in the Jeep market, but now within the Ram HD community. While its true there are numerous other companies producing wheels, bumpers, and suspension systems for this application, you would be hard pressed to find another company that does it with the amount of finesse as AEV. And even more difficult, a company that has built all of their components to work in harmony with one another, but work just as well when used as individual components. 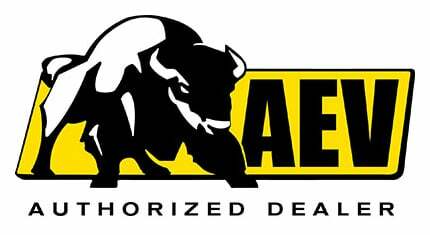 We at Power Products are extremely proud to have the opportunity to be labeled as an Authorized Dealer of AEV products because we know that without a doubt, we can confidently recommend their products because they truly perform as advertised, and fit like they came from the factory. Does the fact that they have a manufacturing headquarters in Detroit, Michigan just down the road from the automakers have anything to do with that? Probably, but we'll let the product speak for itself.